Springtime in Kansas brings more than just flowers… it also brings those nasty spring thunderstorms, dangerous lightning, and sometimes accompanied by tornadoes. Since I would be disconnecting my outdoor antenna during those severe thunderstorms, I wanted some kind of alternative antenna I could use to monitor local ham frequencies… keeping in touch with storm spotters and perhaps more. I’m testing three alternatives at this point. 1 – A 2 meter mag mount antenna on a 20″ pizza pan for a ground-plane. 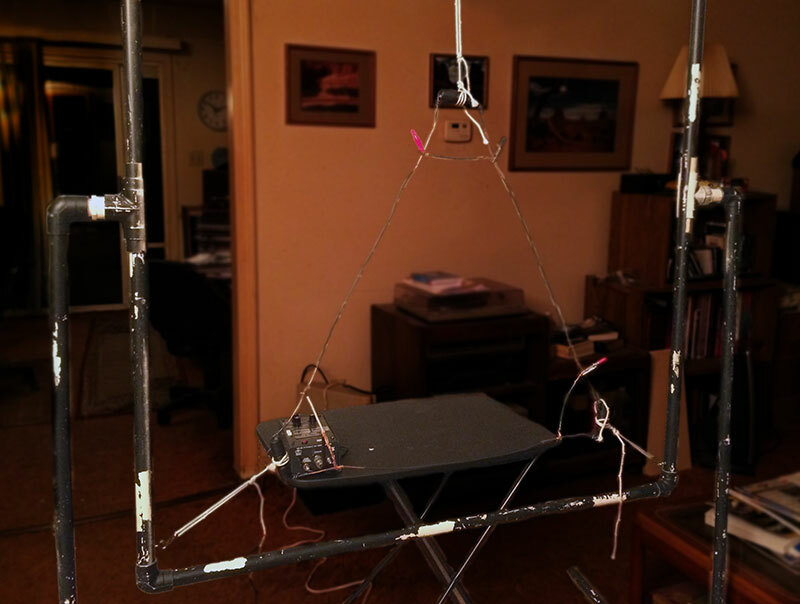 It’s the construction of the Delta Loop antenna that is the subject of this post. I found an interesting project from Gordon Hoag (K2ZS) at K2ZS.com that I thought to model my antenna after. I thought I would build a PVC pipe frame to support my antenna and make it somewhat portable but after building a prototype, I abandoned that idea. It was just too unwieldy and not all that portable. Since I wanted to monitor 2 meter repeater and simplex frequencies, I chose my target frequency to be 146.52 Mhz – the national calling frequency and the frequency used by many hams in my area. I also wanted good SWR at 146.85 Mhz as that was the frequency for one of the more popular repeaters used by storm spotters in the area. Delta loops require a full wavelength of wire (1005/frequency = feet or , for instance 1005/146.52 = 6.859) or approximately 6′ 10 7/8″ gives me the length of the entire wire. 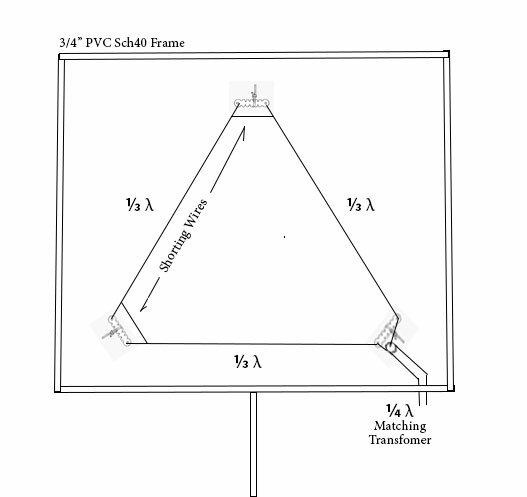 Since I will be building a 3-sided delta loop, I divide that 6.859 / 3 = 2.29 feet or about 27 1/2″ per side. Since I would be tuning the antenna later by either lengthening or shortening it, I decided to start with a bit longer wire for the lowest frequency in the 2 meter band. I figured it’s easier to shorten a wire rather than lengthen it so I started with a wire of the longest length. So I cut my first wire for 144.00 Mhz and split that into three separate pieces (27 7/8″) for each side of my triangle shaped antenna. Like in the K2ZS model, I planned on using dog bone insulators for my corners and shorting wires on the top and one side to connect all three wires together. The wire I chose for my antenna was 14 AWG stranded THHN wire that I purchased from a local home improvement store. Since I wanted to use this antenna for FM simplex and repeaters it would need to be vertically polarized. To do that, it would need the feed point in the bottom corner. The feed point impedance of a delta loop will range from 70 ohms to 100 ohms so I would need to adjust for that matching to 50 ohms for the radio. Instead of using a 4:1 balun, I’ll be using a matching section of 75 ohm coax for my Q-Match. I’ll need a quarter wavelength matching transformer that is 1/4 wavelength of 75 ohm coax (RG-59U) multiplied by .67 to compensate for the velocity factor of the 75 ohm cable. Using the formula 246*.67/f (146.52) gave me a quarter wavelength of 1.12 ft.
After putting everything together, it was time to connect my MFJ-259C antenna analyzer and tune this antenna to be resonate at 146.85 Mhz. I would take a analyzer reading and shorten the wire to raise the frequency or lengthen the wire to lower the frequency. After many adjustments I became pretty frustrated because I could get it resonate around 130.00 MHZ or around 151.00 Mhz, but after numerous trials could not get even close to 146.52. Next I experimented with just feeding the antenna with a single length of RG-59U coax without the matching stub. 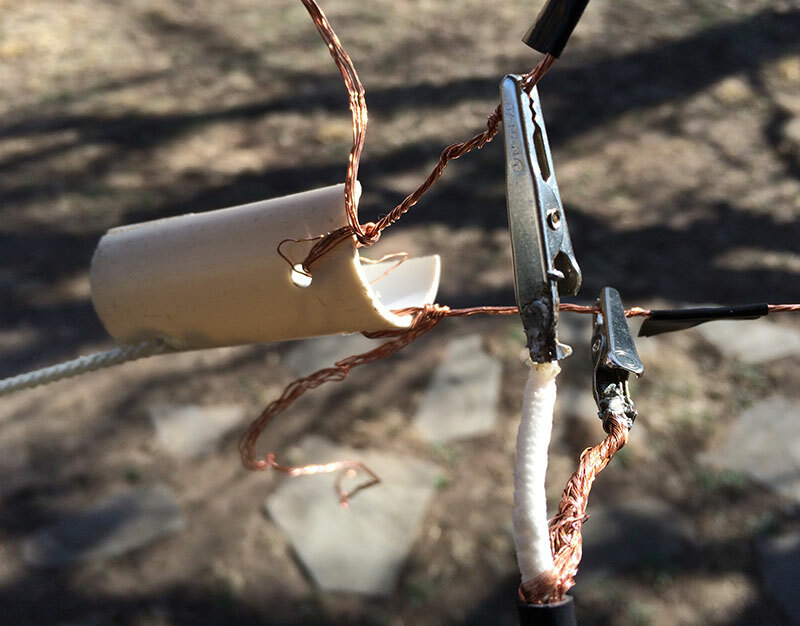 I also tried 8 turns in coax about 4″ in diameter for a balun. No luck. So, it was back to the drawing board and I decided to use a single length of wire instead of three separate pieces connected with the shorting wires. I also abandoned the PVC pipe frame and built the antenna to be hung almost anywhere. Suspecting a problem with either the 1/4 wave stub or the feed line, I rebuilt the matching stub after visiting the coax manufacturer’s website, finding the specifications for the coax, and found a more precise velocity factor for the coax I was using. Using that new velocity factor (.78), I remeasured and cut my new stub to the resulting length… 246*.78/f (146.52) = 1.31 ft.
Again, using dog bone insulators for two of my ends, I simply threaded the wire through one hole of the insulator and a piece of string through the other hole to tie off at the top and bottom. 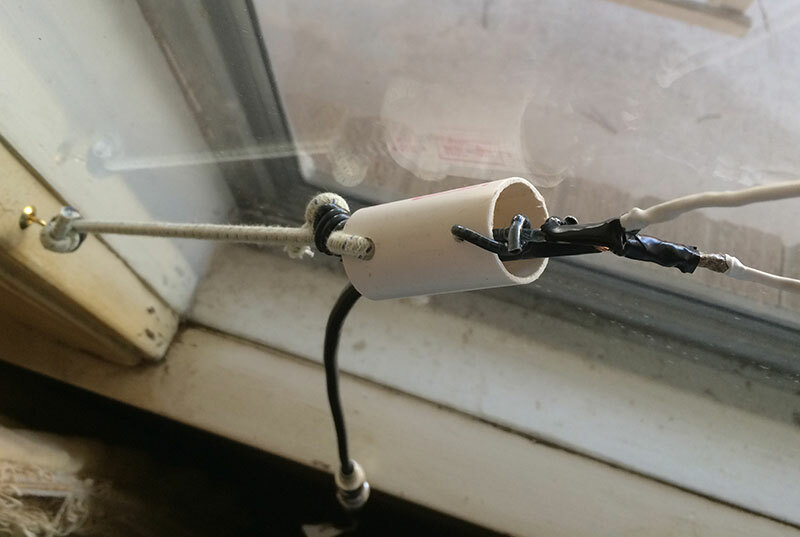 I also devised a feed point bracket out of a cut in half piece of PVC pipe that allowed me to tie off the two ends of the antenna wire and another point to tie off that end to it’s support. I soldered alligator clips to my matching stub so I could move the connection points on the antenna to lengthen or shorten. Using my antenna analyzer and numerous adjustments, I was able to get the antenna resonate at 146.52 Mhz. with an SWR of 1.1:1. I attached the matching stub to a length of 50 ohm coax running to my 2 meter radio and went on the air to test. I was able to work most of the local contacts I’m familiar with. They reported my signal was good and audio good, but with a little static. My reception was also fairly good with some static not present on my outdoor 2 meter Tram 1280 antenna. I also did a quick comparison with my mag mount antenna on a pizza pan and my roll-up J-Pole/Slim Jim antenna hanging from the ceiling in my shack. The delta loop outperformed both of those with better reception and better reported signals. There were a couple more distant stations I couldn’t reach with the delta loop antenna, but felt it was a success for an emergency antenna. To put the finishing touch to my new home built delta loop 2 meter antenna, I soldered the matching stub to the ends of the antenna, cut some lengths of bunjee cord instead of string to tie off the ends, and beefed up the connection point bracket to withstand a little abuse when moving the antenna around. 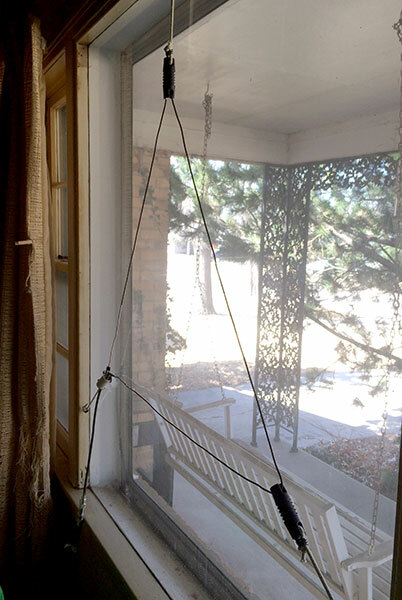 All in all, this first DIY antenna project was a success in more ways than one. Besides giving me an alternative antenna to use when severe weather threatens, it can also make a good portable antenna that easily fits inside my go bag. I learned allot of lessons during this project and also several techniques for cutting wire, soldering, etc. I was also introduced to Smith Charts, although I’ve got to admit I still don’t really know how to use and interpret them. Perhaps they’ll come in again when I tackle my next DIY antenna project.